NORWICH — Bill Bender got an early Christmas present this year. Last week, his company, Solaflect, signed a contract with the U.S. Department of Energy for nearly $1 million to develop the next generation of “concentrated solar power” technology. Bender’s innovative design cuts costs by using 65 percent less steel than traditional solar installations. The award comes from SunShot, an initiative from the National Renewable Energy Laboratory to make alternative energy less costly. Solaflect won one of two awards nationwide for concentrated solar power. But some taxpayers have grown wary of federal investment in private solar technology. Ear lier this year, the California-based company Solyndra fell flat on its face after receiving $528 million in federal loan guarantees. Although Solaflect’s $1 million is small in comparison, Bender — a Dartmouth graduate, Rhodes scholar and Ph.D. economist — is quick to defend the government’s role in developing alternative energy sources. Solaflect’s award comes with some caveats. In order to receive the money, Bender needs to meet certain benchmarks to help the Department of Energy meet its own goals of making solar energy cost-competitive with coal power and other non-renewable sources of energy by the end of the decade. Specifically, Solaflect must achieve a single goal: lower the cost of a square meter of concentrated solar power technology from around $250 to as little as $120 in three years. By 2020, Bender thinks he can get it down to $70 per square meter. His solution is one that would make sense to most engineers. 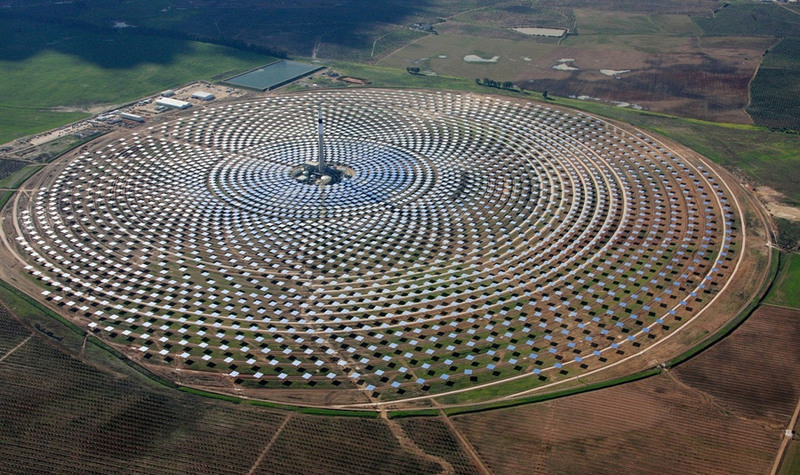 But to understand it, it helps to get a sense of what concentrated solar power looks like. There are several variations; Bender has focused on the “power tower” system. Instead of the photovoltaic panels that come to mind when most people think of solar energy, the system uses a circular array of mirrored panels, called heliostats, to reflect sunlight to a focal point on a central receiver — a “power tower.” Each of the mirrored panels readjusts every 25 sec onds or so to track the sun’s rays. Once the concentrated light reaches the receiver, it can be used to heat water or generate electricity much like a conventional power plant. In the experimental model in Bender’s backyard, five heliostats, each composed of 172 square feet of mirrored panels, concentrate enough light to heat a black metal receiver to 800 degrees Fahrenheit, or to start a piece of plywood smoking in less than two minutes. Bender’s model is a fraction of the size of working power tower systems, such as the one he visited this year near Seville, Spain. Commercial-scale installations can include tens of thousands of heliostats and produce hundreds of megawatts of electricity. And, significantly, the technology employs tanks of molten salt to store heat, avoiding the intermittency problems that plague traditional solar installations. 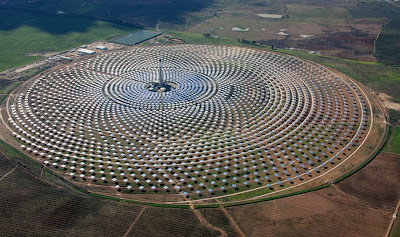 But most concentrated solar power technology uses heavy, expensive steel trusses to hold the mirrored heliostats. Working off the assumption that suspension bridges are more effective than truss bridges, Solaflect has developed a way to support the heliostats with steel suspension cables. The design uses about 65 percent less steel, greatly reducing the cost of the installation. On large scale projects, installation prices could be cut nearly in half. To ensure that his suspension system can withstand high winds, Bender has tested the design on a mountaintop in Vermont’s Northeast Kingdom and on a windy plateau in Wyoming, and the results have been favorable. Solaflect also tries to source locally as much as possible, marking a shift from the photovoltaic market, which is supported largely by Chinese manufacturing, Bender said. Solaflect is on the verge of moving from research and development into the commercial business world. Bender is eager to work with Vermont cheesemakers or brewers to install concentrated solar technology to heat hot water, but declined to reveal which companies are considering signing on as pilot sites. A Rutland native, Bender first took a solar technology course while in college in the 1970s. Then he largely for got about it, working instead as an international consultant for food and nutrition policy in developing countries and founding a successful web analytics company. When he, his wife and their four children (now ages 7 to 19) bought a house in Norwich in 2000, he realized that the sunny, south-facing roof of his hilltop home would be ideal for a home solar installation. But the estimates he got were “ridiculous.” He realized that if the cost was deterring him from pursuing renewable energy, it was also likely deterring others, prohibiting a widespread transition from fossil fuels. So, with his children’s help, he began tinkering in the backyard. At first, he used mirrors from Home Depot and tried out “a lot of stupid ideas.” But eventually, one of the ideas worked. What started as a hobby began to develop into a passion, and, in 2007, a business. Solaflect now boasts five employees, including two engineers. Clean, maybe. But effective? Can solar be a viable energy source on a large scale? Bender thinks so. “As an economist, I think a lot about externalities,” he said, explaining that the health and environmental costs of coal and the military cost of fighting wars for oil in the Middle East are not factored into the price of those resources. If the coal and oil industries paid the real cost of their actions, Bender thinks solar power would be competitively priced today. HANOVER — Jackie Richter-Menge wears a lot of hats, but the most notable might be the trade mark bright pink fleece she takes out for Arctic research expeditions. Richter-Menge is also a civil engineer, a mother of two and lead editor of the National Oceanic and Atmospheric Administration’s Arctic Report Card, an annual assessment of the Arctic environment that provides up-to-date information for policy-makers, educators and others. Though Richter-Menge has written extensively for scientific journals about sea ice in some of the world’s harshest and more remote regions, the Arctic Report Card is meant to reach a broader audience — to get hard facts and observations from the scientific community out to the general public. This year’s Arctic Report Card (a misnomer of sorts, because it doesn’t include any “grades”) is the largest and most comprehensive since the project began in 2006. Released in early December, it includes data and essays from 121 researchers in 14 countries. Some of the reports are to be expected: sea ice is continuing to melt, and ocean temperatures are continuing to warm. But there are some surprises, too: whales from opposite sides of the world are meeting in the Arctic Ocean for the first time in a very long time. One of the conclusions of the 2011 Arctic Report Card, says Richter-Menge, is that scientists believe data has now been collected for a sufficient number of years to indicate that sweeping changes in the region are not just a fluke: they’re the “new normal,” and will affect not only humans and animals living in the far north, but much of the planet for years to come. The Valley News met up with Richter-Menge in her office at Hanover’s Army Corps of Engineers Cold Regions Research and Engineering Laboratory last week. The following is an edited transcript. VN: How does what’s going on in the Arctic affect people besides those who live in the Arctic Circle? JRM: I would love to see David Lettermen do one of his street questions on “Is the U.S. an Arctic nation?” because I think the majority of people would say no, it’s not. We tend to forget about the fact that Alaska makes us an Arctic nation. It affects us directly because it is part of the United States. You can hear the controversy going on in the U.S. about the development of oil and gas in the Alaska region. It also affects us directly because we’re starting to see more and more links between the weather systems up in the Arctic and what’s happening down here. For instance, the past couple winters there’s been what they call an “outbreak of Arctic cold” in this area. The way the weather system is set up, the cold air in the Arctic kind of stayed in the Arctic and kept it cold. But the past couple winters, what we’ve seen is a surge of the cold weather from the Arctic pushing south and into the Northeast. When the cold air comes down into the lower latitudes, it pushes warm air up into the Arctic and sets it up for even more melting. VN: It’s like a vicious circle. JRM: You can think of the Arctic as one of the planet’s thermostats. It’s got this bright white sea ice cover that sends sunlight back to space to help keep the planet cool. When that melts, it’s replaced by very dark ocean, which absorbs sunlight. Because it keeps absorbing sunlight, it’s getting warmer and warmer, and that causes the sea ice cover to reduce even further. The Arctic basin is like a bathtub surrounded by continents. In the wintertime, it’s totally filled up with ice. In the summer it melts — but it doesn’t all melt, there’s still a slug of ice in the center. What’s been happening over the past few years is the amount of open water in the summertime has increased significantly. There are projections that the Arctic Ocean will be repeatedly open by probably mid-century. VN: What are the implications of that? JRM: It does a lot of things. In addition to changing weather systems and wind patterns and such, the persistence of this melting is beginning to affect the marine ecosystem. We can see that from the little tiny phytoplankton all the way up to the marine mammals. In terms of phytoplankton, there’s more sunlight and it’s warmer so there’s more of them growing. But marine mammals depend on sea ice cover for their habitat, so the loss of ice is affecting them negatively. There are winners and losers. VN: Are whales winners or losers? JRM: Well, it depends on the year. This year, whale pods are in communication (laughs). Whales from the Atlantic region saw whales from the Pacific region for the first time in our lifetimes because they could get through the sea ice. They can actually co-mingle. That was a big thing this year. In addition to the marine mammals affected, people are also beginning to see this area that was very foreboding and remote become more accessible. Oil and gas companies are deciding that it’s worth the time and investment to figure out how to recover oil and gas deposits there.Tourist ships are making more and more visits to the Arctic, which is also risky. There’s concern that a ship that’s not ice hardened would get caught in an ice field. There are not any bases up there to do search and rescue effectively. The other thing that’s happening is with more open water is a navigable sea route opening up north of the Eurasian continent. This sea route cuts out a lot of time compared to going through the Suez Canal. It’s about a third shorter. VN: How much of this report, and the work you do, involves climate change? JRM: The Arctic Report Card is not so much a report on climate change as it is on the conditions in the Arctic. What we try to do is to pull together a report that’s observationally based, as opposed to based in models. We just want to provide hard facts.The goal is really to try to make something that’s accessible not only to scientists but also to policy makers and students. We’re trying to make it more accessible as time goes on, because part of our job is to educate those who are making (or will be making) decisions. Though we try to give the most current picture of what’s going on in the Arctic, whenever possible we put that in the context of historical records. For instance, we looked at the sea ice cover of this past year, but we put that in the context of what we’ve observed since satellites were first put up in 1979. We have about a 30-year record. Obviously there’s a link into climate change, because this provides some of the most compelling evidence we have of the warming climate. There’s this thing we call Arctic amplification: if you look at the climate warming over the last 30 years, the average increase around the planet is about 1 to 2 degrees centigrade. In the Arctic, it’s 2 to 4 degrees. We might want to argue about why it’s happening, but we know now that it’s basically happening. VN: Although your job is simply to present evidence and facts and observations and let people do with it what they will, what would you personally like to see come out of this work? JRM: I would like people to understand that the climate is definitely warming and there are implications and we need to really begin to commit to looking ahead at what is coming toward us and making decisions accordingly. In the U.S., we spend a lot of time educating ourselves because we have the ability to do that. It’s a bit of a privilege, but you will see amongst our peers that the U.S. is one of the last places where people are still wondering if climate change is real. I’ve done work in other countries, and everybody’s like, ‘What gives? Why is the U.S. not on board with this?’ In some ways it’s kind of embarrassing to be a climate researcher form the U.S. because your scientific peers look at you and are like, ‘Well? Why can’t you get the word across?’ (Shrugs, looks up at ceil ing and laughs). I don’t know. We’re trying out damndest. So I would really like to see that part of the debate end. If you look at the population of the U.S., people like to go to the coasts. So let’s deal with the issue of sea level rise and how that’s going to impact infrastructure. Let’s consider what were going to do as far as being better stewards of the planet, how were going to be more creative with our energy. All of those things can be positive economically, but we just can’t seem to get in front of this. We’re still caught up in the debate of whether this is an issue or not, and I’d love to see that change. I'll start posting again in January; for the past month I haven't had internet access except while at work. 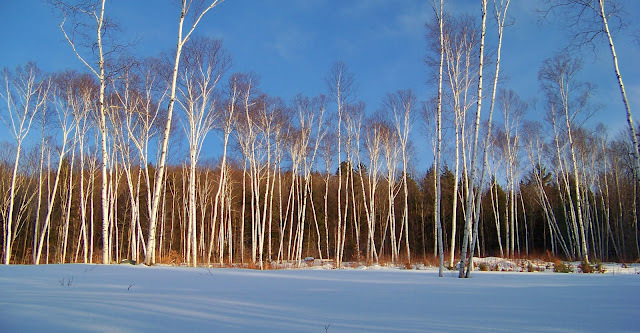 For now, December's lone blog posting: a poem for the holidays, for warm houses full of people, for the times you'll look back on. is washing up from the night before. cold water for low notes, hot water for high. calling after their Irish setter whose name is Cleveland. as she turns and resettles and the bed creaks. who haven't seen each other for over a year.